The Governments of Samoa and the People’s Republic of China signed the Economic and Technical Cooperation Agreement which will facilitate the implementation of prioritised projects submitted under China’s grant aid. The Agreement aims to further develop the friendly relations, economic and technical cooperation between the two countries; and in accordance with the needs and priorities of the Government of Samoa. Through the Agreement, the Government of the People’s Republic of China will provide RMB (Y) 100,000,000.00. One project, among others, that has been identified for implementation through the Agreement is the Police Academy. The Government of the People’s Republic of China continues to provide support to many national development projects in the area of sports, agriculture, education, health and infrastructure. 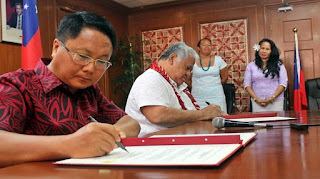 Tuilaepa Lupesoliai Sailele Malielegaoi, Prime Minister of Samoa, signed on behalf of the government while Wang Xuefeng, Ambassador of China to Samoa represented his government.